Animal print is my all time favorite print, particularly leopard print I can't get enough of it! I have enough pieces in my wardrobe that I could actually dress head to toe in the stuff (I wouldn't though that might look a bit silly) I mostly wear animal print in the autumn/winter as it's quite a dark print and I find it hard to match with my summer wardrobe. Well that was until I discovered this ASOS animal print t-shirt dress, I don't usually wear red but I just love this take on leopard print with the clashing green it really gives it a bit of edge. T-shirt dresses are my current favorite type of dress at the moment, they are so easy and comfortable to wear! In the day I would throw it on with a pair of sandals, pumps or brogues and at night add a statement necklace and some heels! Done! For me animal print in the summer should be bright or worn with bright contrasting colours especially neons to keep it looking playful and fresh. If you are not brave enough to rock a summer time animal print dress or if it's a bit much for you, then how about to your accessories or shoes? An animal print bag or belt is a great and easy way to add a small statement to your outfit. 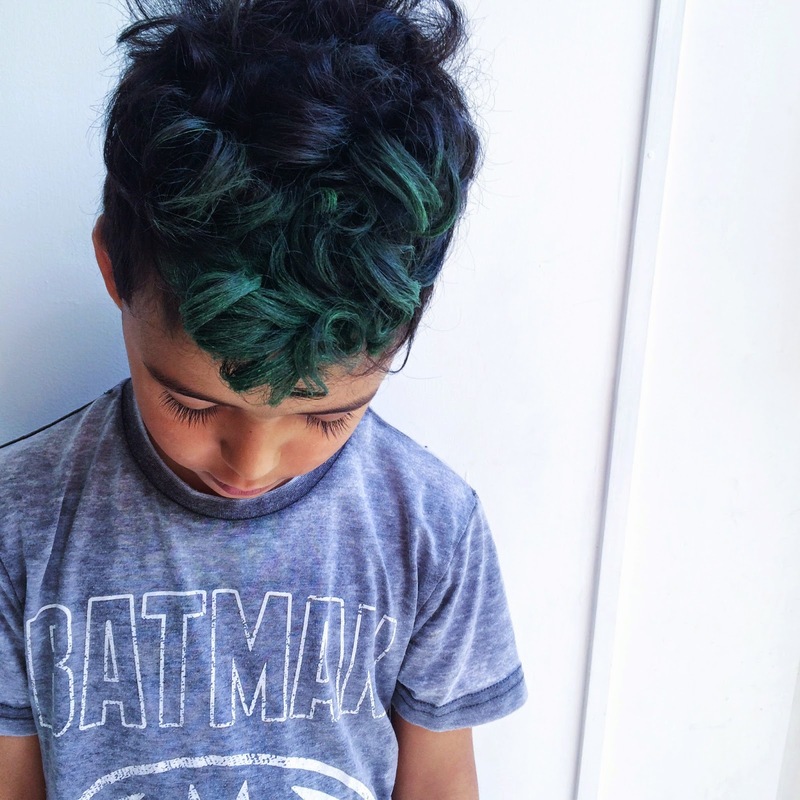 "I want green hair today mum" announced Tiger at the weekend. 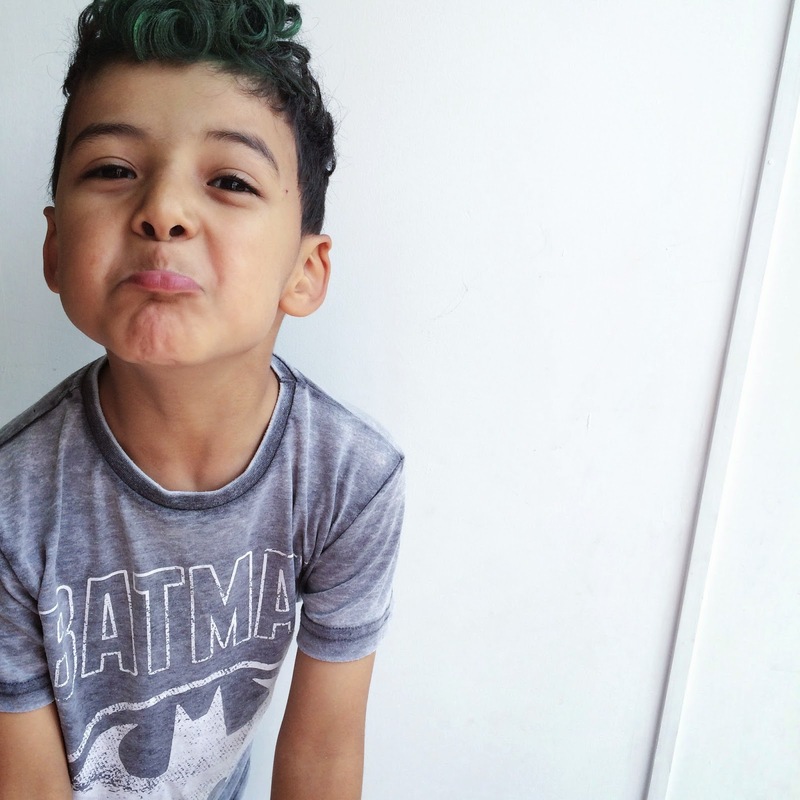 He's seriously into Teen Titans Go and his favorite character is Beast Boy (a green superhero, with green hair, that turns into green animals!) I'm guessing this was his style inspiration. I love a bit of dress up so was happy to oblige. I wouldn't use any heavy harsh products or chemicals on his hair and would want it to wash out easily, I think green hair would probably be frowned upon at school come Monday! Plus I still have my box of hair chalks from when I experimented with blue hair myself, so it wasn't a big deal to do. 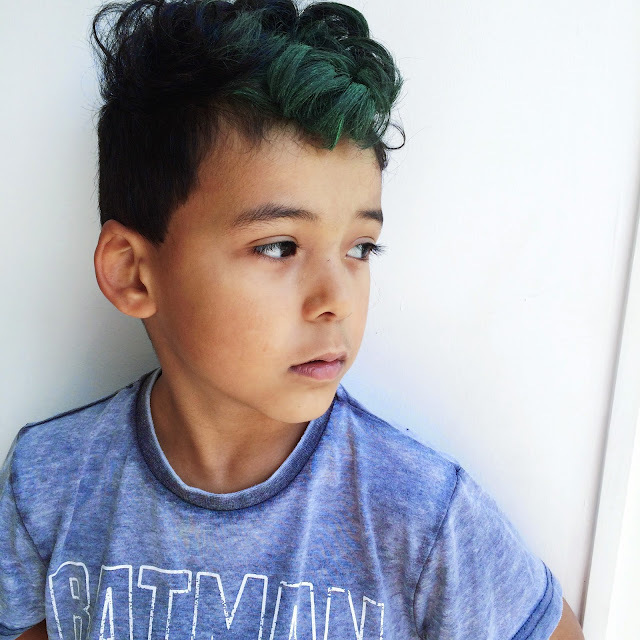 Hair chalk is really easy to apply, which is brilliant as although Tiger had the ingenious idea of green hair he wasn't interested sitting around for ages while doing so! To apply all I had to while he fiddled around on the iPad was dampen the part of his hair we wanted to chalk dye green and rub the block of chalk to it, considering how dark and thick Tigers hair is it took pretty much within the first few strokes although we added a few more layers of chalk colour for a brighter green and if it was for myself I would have added a few more layers so it was more vibrant. It is pretty messy so I wore gloves and Tiger was in an old t-shirt, although it does wash out easily I didn't want to take any chances. 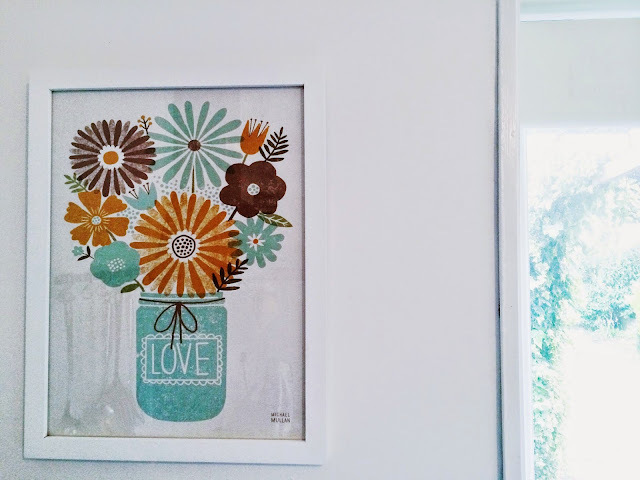 The instructions say once fully dried to use a hair straighter to seal in the colour, I skipped that part as I wanted it to wash out easily with just one wash which was fine for just wearing it for the day. We washed it out at bath time which was quick and easy and Tiger was super impressed by the green bath water. I personally love using hair chalk on my own hair for an instant quirky hair colour. It's a bit messy to apply and would take quite a while applying to the whole of my afro so I'm quite happy just doing sections of my hair be it strands, ombré or just a braid. 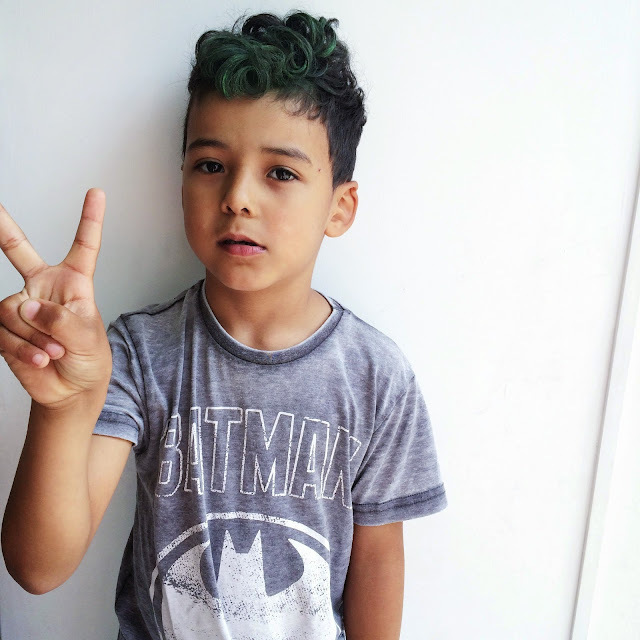 Tiger loved his green quiff, much cooler than 'Beast Boys' all over green hair do. Apparently he's have red next time.